Looking for a new band that shines with talent enough for two? Meet OF Fate And Chance! There are times, I’ll admit, when modern music leaves me wandering around aimlessly, with my arms to the sky as I shout out in frustration that there are no more “good rock bands” on the radio. Of course, we won’t mention the fact that my teenaged years were in the eighties, which makes Motley Crue the rock band I listened to the most. Nope, that’s irrelevant to the point so far as I’m liable to bend all reality in such a way as to skew it to fit my preconceived notions! Reality shmeality! Usually, I’ll find new bands and new music through happenstance or the rare suggestion of a friend. Sure, that means that I generally miss out on about 99.99% of any and all of the newer bands that might actually be worth listening to… but when you have a policy in place, there’s no real reason to rock the boat and start stepping outside of the box. It’s warm and cozy in the box, people. Whatever whimsical notion and assortment of circumstances that brought me to become a part of the Blogcritics family, however, has shaken up my musical world. In short, it’s shaken up my box. Generally, I hate it when people shake up my box. Blogcritics has allowed me, is the point that I am very laboriously making, to experience music and discover bands and sounds that I might not otherwise have heard. Today’s case in point is a small band from Jersey, named Of Fate And Chance. 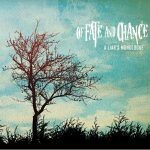 Of Fate And Chance, comprised of Sean Massaro, Ryan Bergamotto and Jon Fleck, are a small band of relatively young guys that have decided to take a relatively huge step on the path to their future, by releasing their new EP A Liar’s Monologue, independently. It’s that fact that got me babbling on and on about how I rarely find myself faced with exciting new music. Here was a situation and a band that I would never otherwise have heard of, were it not for my new found friends and family here at Blogcritics. And that would be a shame, because this is a damn good EP. “Thulcandra’s Illness: Silence” kicks everything off by not really kicking anything at all. It’s slow, it’s ponderous, and it lulls you into following this sedate groove that loops and swirls upon itself. Only thirteen seconds shy of 2-minutes in length, it is a nice and unique way to begin your relationship with this EP. You can’t demand to hear the roar of the crowd after a home-run, until you’ve settled into your seat and find yourself surrounded by the ambient sounds of the ballpark. Okay, wait. That may be the lamest comparison I’ve ever made… but I like it! “Artwork Dancing” finds OFAC taking that mellow mood set up by the opening track and then promptly blasting it into outer space with a wonderfully up-tempo groove. If silence is the sickness that infests Thulcandra, then this song sets out to rip apart the clouds and demand that the sun shine down on everyone’s smiling faces and dancing feet. It is one of my favorite songs on the EP, no question. “A Liar’s Monologue” stutters out of the starting gate with this great interplay between the back-beat rhythm and the guitar’s insistent groove. Eventually, the song erupts into the chorus, only to plunge right back down into another shift in the groove. Funky, simple, and just plain happy to make the acquaintance of your ears, it isn’t hard to see why this was chosen as the title track. Love this song. “Moonstrung Intoxication” is pretty much the song that signalled to me the fact that this was going to be a cd that I would enjoy. If an album can hold my interest through the first three or four songs, then I know it’ll be worth making my way through until the final track. Too many albums these days are loaded with two decent tracks at the beginning of the album only to be followed by a chain of mediocre songs that could of (and should have) been improved upon. Not here, though. This song has a great little guitar riff that rides along the very capable back-beat of the drums, only to find itself draped with some very lovely vocal work from the guys. As a matter of fact, I’ll say that for all the tracks, really. Not only does OFAC’s musicianship work well together, but so do their voices. It’s nice to hear a band that can play and sing at the same time. “Photo Not-Graphing Emotions,” aside from being one of the more tongue-twisting song titles that I’ve happened upon in a while, also happens to be a damn decent song. Buoyed by some really nice work by the bass and lead guitars, the song just rockets along and leaves you at panting at the end and wanting more. “Welcome Back To Unconsciousness,” while a good song, is maybe not quite so tight and righteous as the others that come before it. Then again, when I sit and listen to it again (and again) — I realize that I wouldn’t be doing that, if there weren’t something interesting about the track. Notice; I’m not saying this isn’t a good song, only that I’d give it about a 7/10 as opposed to the 9/10s that I’d probably give the other tracks. I’ve had to listen to bands that I WISH would have had something worthy of me labelling as a 7/10! “The Hollywood Charity” brings me back in absolute rock and roll happiness, as it soars on the wings of some wonderful drum work. Ye gods can this kid play! How he’s not panting on the floor in a sweaty wreck after playing this song, I have no idea. Probably my 3rd favorite song on the album. “Coordinates” announces itself, and the end of the EP, with a thunderous bass-line groove. After that, it really doesn’t’ look back, as it climbs and drives itself into a very nice little rhythm. I’ve gotten to know and love this song, as it is the one that lets me know that it is time to hit “repeat” and start the album all over again. Love it. I guess what I’m trying to say in my usual subtle way (i.e. babbling incoherently and mixing in phrases such as “it rocks!” or “it RULEZ!” in every paragraph or so) is that OFAC have given me what I didn’t even know I wanted — what I needed. A new and talented band that I can now have the pleasure of watching grow and mature; a band that has enough talent to survive the current trend of pimping a band for one (maybe two) albums, only to cast them aside as they look for the next new thing. OFAC have a bright future ahead of them, I think. Especially if they continue to record and release music as mature and well-written as the material on A Liar’s Monologue. My hopes for them are that they get the chance to put these songs (or others) on a major label début in the future. And, of course, that I get to review it! Of Fate And Chance are currently allowing purchase of A Liar's Monologue on their myspace page for both U.S.A and international orders. They're also selling a fairly rockin' band t-shirt that I wish I were slim enough to be able to fit into, as well. Darn it!